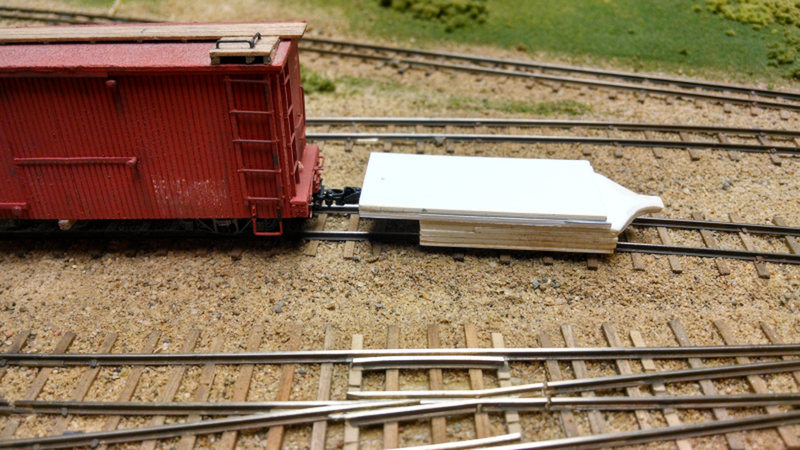 Here is my coupler gauge, built from a stack of styrene. The tongue sticking out to the right can be used to gauge the height of the mount. The tongue is the proper 18″ height for the body and should just slide under the coupler mounting location. To the left if a mounted coupler for comparing mounted couplers. The KD 714 is the standard coupler used for all of my rolling stock. Having all of my couplers mounted at the same height will improve reliability of operation. My trains operate most on modules which always seems to have minor humps at the module joints. There is just no way to make the modules 100% flat cross all joints, thus uncouples can happen at the joints.